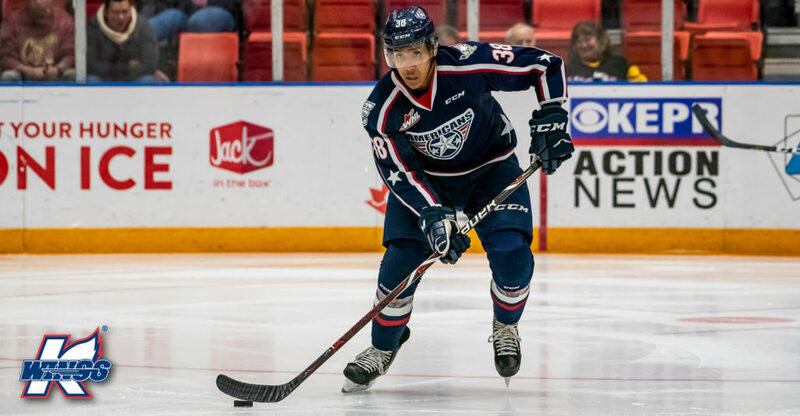 KENNEWICK, WA – The Tri-City Americans announced today that Aaron Hyman has signed a Standard Player Contract with the Kalamazoo Wings of the ECHL. Hyman spent the first 1 ½ seasons of his Western Hockey League (WHL) career in his hometown with the Calgary Hitmen before being traded to the Seattle Thunderbirds. The defenseman won the WHL Championship and played in the Memorial Cup with Seattle in 2016-17. He was traded to the Regina Pats the following season and competed for the Memorial Cup a second time when Regina hosted the 2018 tournament. Hyman landed with the Americans this past November in exchange for Brett Clayton and a 3rd round 2019 Bantam Draft pick. He finished his junior career with an offensive breakout season, posting 50 points (10 goals, 40 assists) in 68 total games. Through 232 career games in the WHL, Hyman recorded 82 points (16 goals, 66 assists).